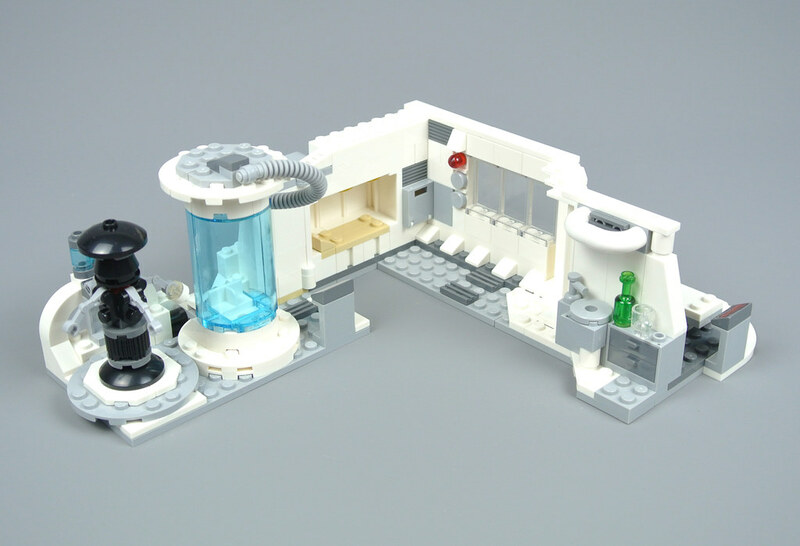 Echo Base and its surroundings have inspired numerous LEGO Star Wars sets during the last two decades, the latest of which is 75203 Hoth Medical Chamber. 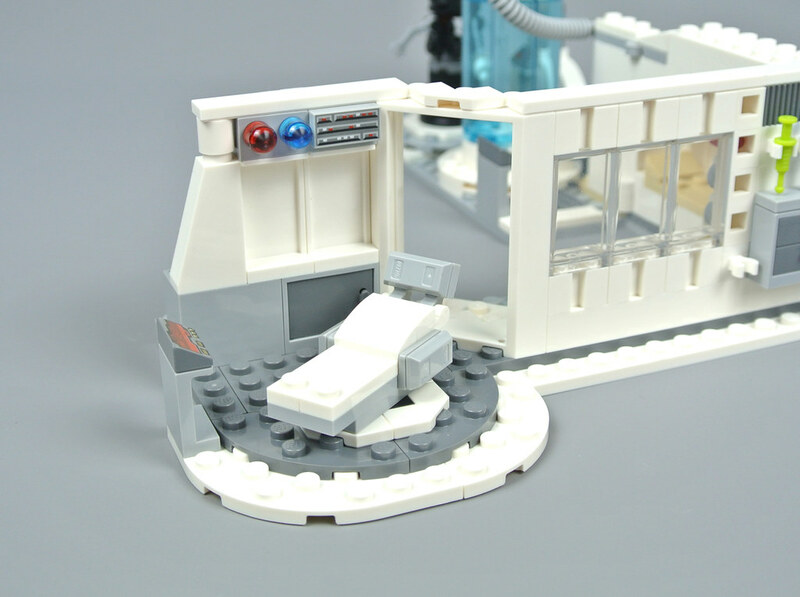 This interesting set contains 255 pieces and is only the second rendition of the Rebel Alliance medical bay in which Luke Skywalker recovers from the Wampa's attack. 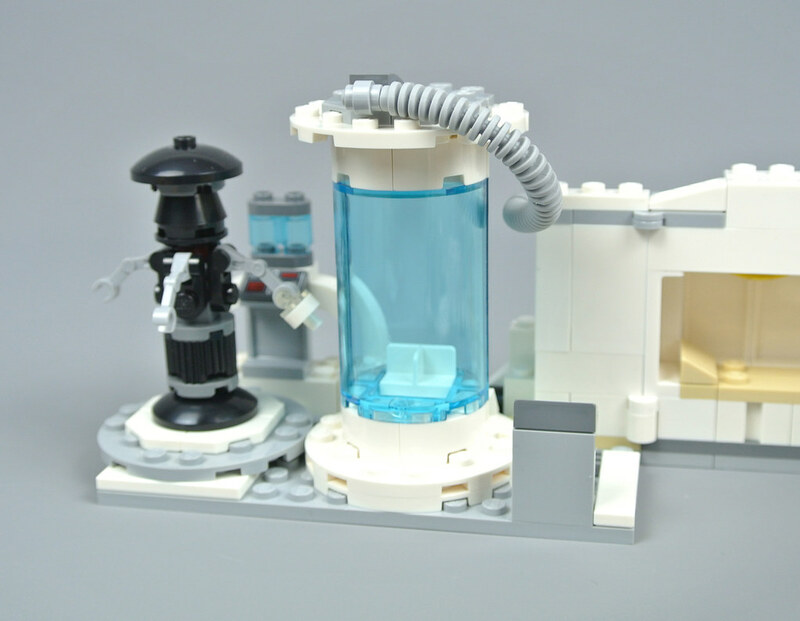 Furthermore, this set includes three unique minifigures and an FX-7 medical droid. Versions of these characters have appeared in previous sets but they are very rare so the new figures should prove popular. 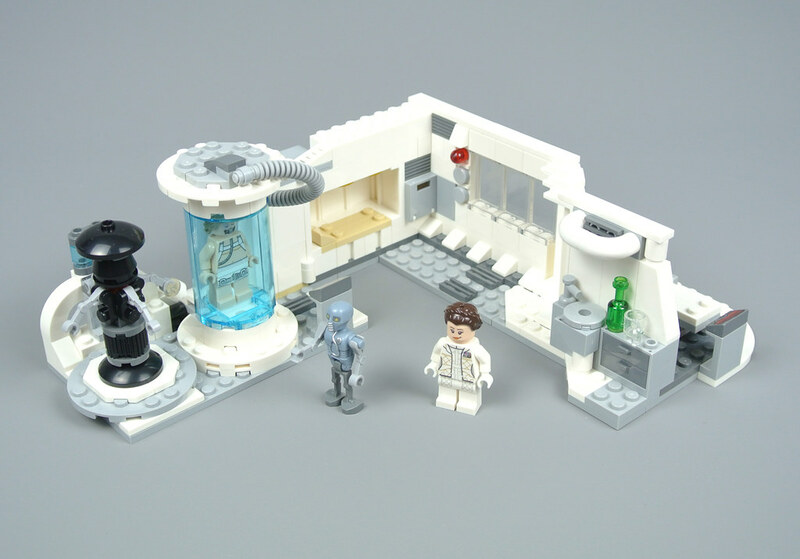 I therefore have high expectations for 75203 Hoth Medical Chamber, especially as an accompaniment to the much-maligned 75098 Assault on Hoth. Having suffered serious injuries at the hands of the Wampa and experienced several hours in freezing conditions on Hoth, Luke Skywalker is placed inside a bacta tank for recovery. During this period, he wears a white medical harness around his chest and hips along with a breathing apparatus. The tube printed on the front of Luke's torso lines up neatly with the breathing mask and the metallic silver buckles on his thighs look great too. 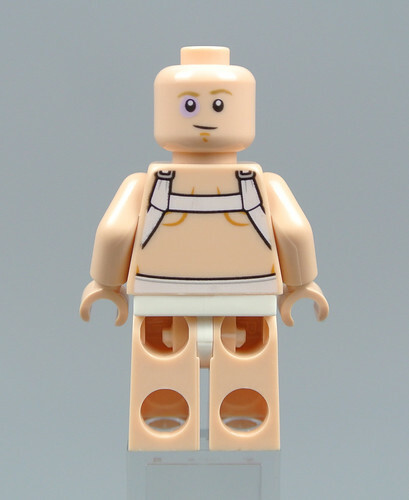 A similar minifigure appeared in 7879 Hoth Echo Base from 2011 but this version features a dark tan hair piece rather than a tan element. I think the new colour is more appropriate for this scene and like the weary expression on the reverse of Luke's head. Both sides include some bruising around his right eye, matching the character in The Empire Strikes Back. Princess Leia has often been omitted from sets based upon Hoth in the past, most notably in 75098 Assault on Hoth. 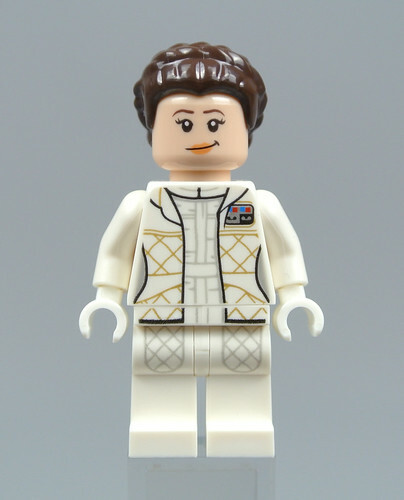 Fortunately, she is included here and looks brilliant, sporting the same padded attire that she wears in 75192 Millennium Falcon. I like the diagonal striped pattern on Leia's jacket and the colourful command insignia pinned beside the collar looks perfect. 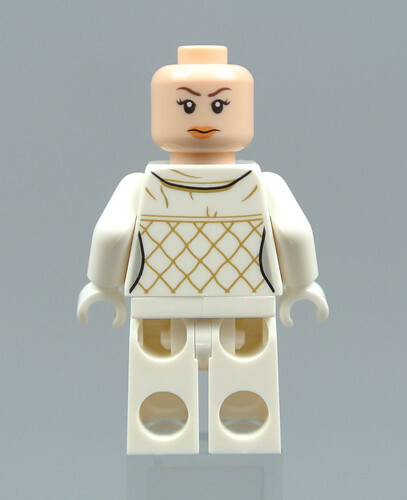 This version of Leia features a double-sided head which has been used on a few previous occasions. One side is decorated with a wry smile while the other appears rather frustrated, as one might expect given Han's arrogant behaviour! I like her dark brown hair piece too. This element does not match the movie exactly but is certainly the most appropriate of the existing parts that were available to choose from. Two medical droids supervise Luke's recovery on Hoth, the first of whom is 2-1B. This character last appeared in 7879 Hoth Echo Base but has now been updated with dark bluish grey legs which look superb when compared with the source material. The sand blue torso and head component is even better though, including excellent moulded detail as well as lovely metallic silver printing and yellow photoreceptors. Unfortunately, the back of 2-1B's torso features two cavities which look somewhat awkward, although some additional moulded detail is visible from this angle as well. Naturally, the droid comes equipped with a vast array of medical accessories, including scissors, a trans-green bottle and syringes in two different colours. FX-7 accompanies 2-1B and includes four articulated arms which can grip accessories. 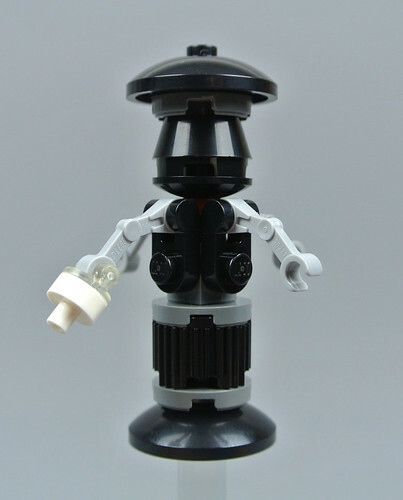 This rendition of the droid captures its general shape but areas of the figure lack detail, particularly around the head where some printing would have been welcome. The FX-6 medical assistant droid from 75183 Darth Vader Transformation looked more faithful to its onscreen counterpart than this FX-7 model, although the Rebel Alliance droid serves its purpose adequately within this set. 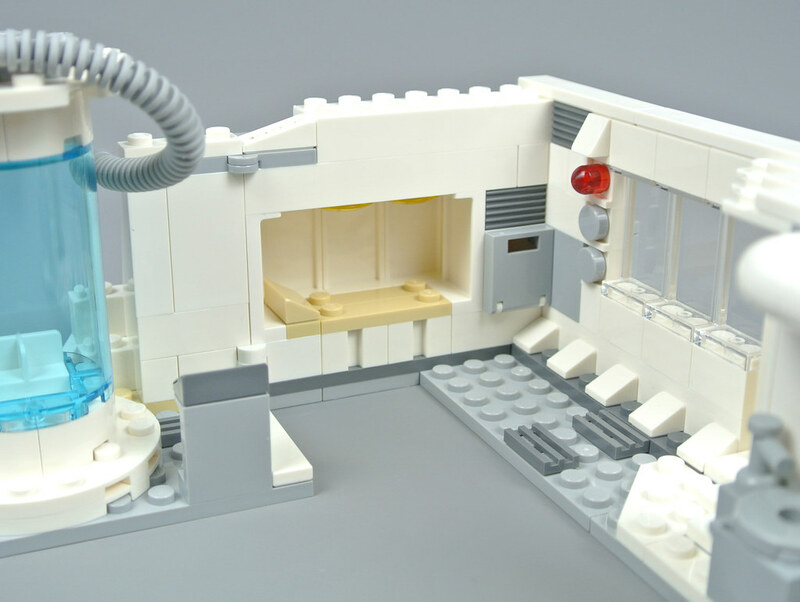 Echo Base was established a month before the Battle of Hoth but has already been outfitted with an extensive medical centre during that period. 7879 Hoth Echo Base is the only previous set to include this section of the Rebel headquarters but the brand new model is more detailed than its predecessor, featuring not only a bacta tank and a rotating bed but also several other pieces of medical equipment and a window for visitors to view the patient. The model measures 21cm wide and 18cm deep when opened, as shown in the image above. It can also fold up to create a more realistic space, although the former configuration makes it much easier to play with the minifigures and I think it looks more impressive on display when opened out. However, the model will slot into a smaller space when closed and the bacta tank lines up nicely with the window, just as in the film. A small examination room is situated beside the main chamber, featuring a rotating bed and a control station for the medical droids. The bed is nicely constructed using light bluish grey ingots and a pair of trans-red and trans-blue lights are fixed to the wall, perhaps denoting whether the room is in use or an emergency situation. This set contains numerous printed pieces but no stickers which will undoubtedly please many LEGO fans. There is room to store medical equipment inside a cabinet beside the examination bed and four clips on the wall provide even more storage. I appreciate such thorough detail but am not convinced that so many cabinets and drawers were necessary as this set does not include enough accessories to occupy them all. The window looks marvellous though and the rear wall, which is not really intended for display, has been finished quite nicely. The larger medical chamber is even more detailed, including some white pipes on the wall, two more drawers and a light bluish grey sink. Such examples of sanitary ware seldom appear in the Star Wars universe but it seems sensible that a medical centre would include somewhere for personnel to clean up. The trans-green bottle, on the other hand, does raise some questions! Presumably this is intended to represent medicine. Another bed is set into the wall of this room. I like its tan upholstery and the textured wall panels beside the bed look great. There is plenty of space for a minifigure to lie down here and two trans-yellow lights are fitted to the ceiling above the bed, although they are only visible from certain angles. This appears as Luke prepares to leave the medical centre and looks pretty good in relation to the source material. Bacta tanks have appeared in a couple of previous Star Wars sets but this is definitely the best version yet. Its cylindrical shape is marvellous and I like the flexible hose which links the top of the tank and the wall. The bacta tank is flanked by two monitoring stations for the droids and FX-7 stands on a turntable so can rotate with ease. This is fun but the medical assistant droid only rests on a single stud so could also have turned around without a turntable. The bacta tank opens on a hinge, allowing Luke Skywalker to stand inside. He fits perfectly but I have found that there is a narrow gap between the two halves of the tank, due primarily to the flexible hose which seems to push the front half forwards very slightly. Nevertheless, this is a minor issue and the completed bacta tank still looks good in my opinion, as well as offering excellent play value. 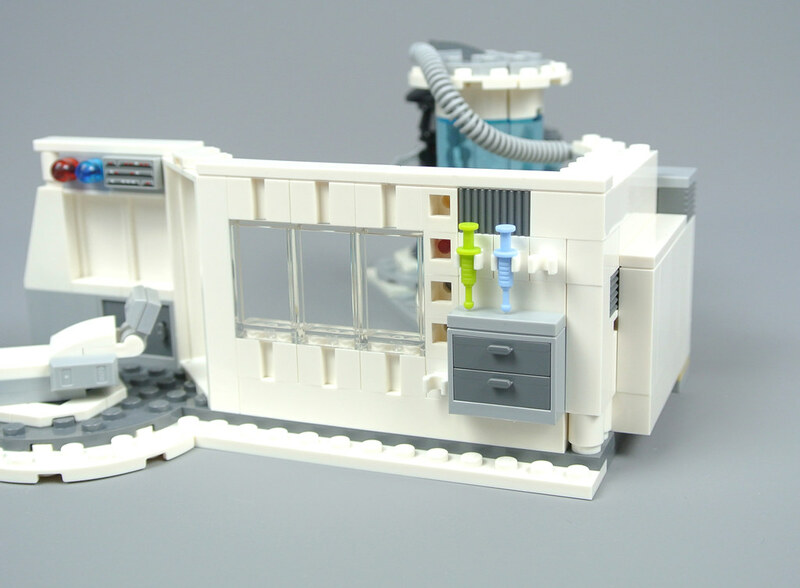 I was somewhat surprised to learn that LEGO would be releasing 75203 Hoth Medical Chamber when it was unveiled a couple of months ago. This location is reasonably prominent in Star Wars Episode V: The Empire Strikes Back but such subjects usually form part of larger sets rather than being the focus of a small one. However, I think this is a superb set on the whole, including an interesting selection of figures and a highly detailed model. That detail is impressive and the model looks brilliant on display but I do wonder whether it was all necessary. For instance, the medical bay comes with four separate storage areas but contains relatively few accessories. In fact, I think a more compact rendition of this location would capture a similar level of detail so might have preferred a smaller set. The UK price of £34.99 is disappointing as well, although $29.99 in the US is more reasonable. Even so, this is a welcome addition to the Star Wars range and I hope to see similar sets in the future. Really like this one, it's just a shame that the release schedule for anything Hoth related is so off kilter. The AT-AT gets discontinued just before AOH, now they release this after the relatively short shelf life of AOH. Really like this little set, honestly. Reminds me of 75932 Jurassic Park Velociraptor chase in how you've got a couple of little compartments thrown together to enact out a number of scenes (both your own and from ESB). A lot of detail crammed in as well. I do feel like there should've been a bit more stuff included. Either a little extra sidebuild, or an actual extra minifigure. Yes, yes, four figs for a 30 pop set is rare for Star Wars, but I think it would have made this set worth it's pricetag. Just an extra Rebel doctor, or C-3PO even; just feels a bit bare now. Whats with all the overpriced sets lately we seem to be getting? 255 pieces for £35? That's nearly 14p per piece in the UK. Should be much closer to £25. I'm gonna wait till its on sale before buying this one. 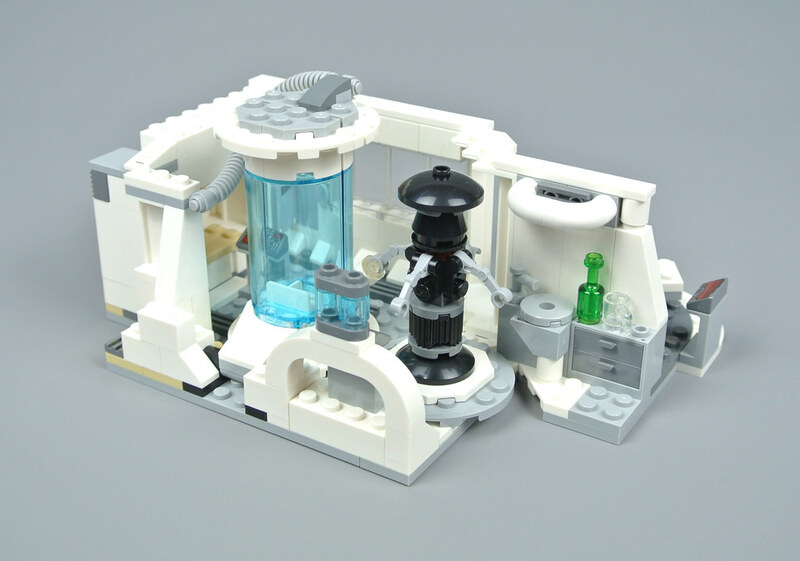 Looks to be a decent set for those who weren't around the last time Luke was in a Lego Bacta tank. For me, though, I can pass on this set. I wouldn't mind collecting about 5 of Luke's head from this set, though, for non-SW mocs. That wall niche bed is totally in the film. It's more clearly seen when Luke is suiting up before the battle and talking with the droid, but it looks like he's also lying in it when the others come to visit him in the earlier scene. The cushions are white rather than tan though. In any case, a cool set with a lot of neat details, and great figures. Shame about the price though, in any currency. Fun fact. This is the smallest set fleshie-Leia has ever been included in. I think that to make up for LEGO’s failure in the 2016 UCS Assault on Hoth, LEGO should release a great, brand new line of Hoth sets. These could include the base by itself, an AT-AT by itself, a wampa cave by itself, and some other small sets. Putting it all together in one UCS Set just didn’t work, and the 2010-2011 line of products was largely successful. Not that big, but great attention to details (which does not bother at all) and to the source material make this one worth a purchase IMO. Leia minifig is among the best to me, and this Luke is missing in my display cases. If sometimes I complain about re releases or new versions of already existing sets, I won't complain about this one and will get it for sure. Maybe with a discount... Maybe not! Thanks for the review this time again. @Rob42 - Thanks, I neglected to check that later scene and have updated the article. My comments on most set reviews nowadays are all complaining about the price.. so I have to say that this is a pretty nice set. Great to get Leia with a Hoth-outfit and injured Luke. 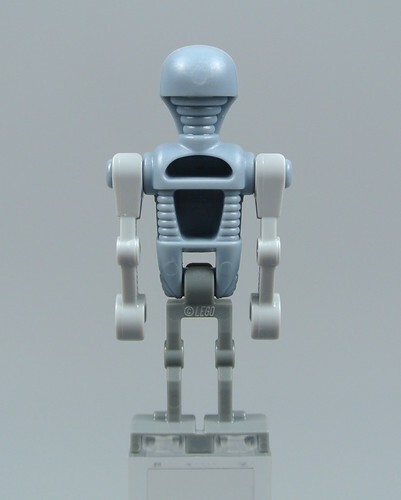 But, since most droids are not "real" minifigs, maybe a CMO or even Carlist Rieekan could've been included - just throwing out some ideas. But whoever greenlit that 40€(!!) German price tag needs to reevaluate their life. According to Commenter @XIII above it's even more expensive at 45€ for people in France and the Netherlands. Conclusion: Fellow Europeans, I urge you to let this set rot on the shelves until they drown in it and have to sell it for 15€. Looks kinda boring to me, but that's probably the lack of spaceship. It seems to me that Lego prices things high to nail all of the people who can't wait for sale prices and then the rest pick it up for 20-30% off. They still make out like bandits. This is a $19.99 set. No more. £34.99?! I would have expected this to be a £19.99-£24.99 set. Yikes. I actually think that's a lot nicer than it seemed to be at first glance. Lots of detail, nice minifigures. A very odd thing to make a set out of (can't imagine this appealing much to kids), but I can't complain as an AFOL. The price is really rough though. Even worse in my country (£38). It'd need to be at least on 25% discount to even be remotely worth buying, but given its limited appeal I can certainly imagine that won't be a problem as long as you wait for a sale. Have to wait for a 40% amazon discount like some hp and fantastic beasts sets are already on heavy discount on amazon.co.uk. Honestly, as nice as this set looks, I am going to do exactly what @Ephseb suggests: let it rot on the shelf until there is at least a 30% discount. I mean, really TLG? 45 Euro in France? That is more than 50 (!) USD. Why does TLG think people in the US deserve a 20 USD discount from the start? No wonder their sales numbers are dwindling. And anyway, why not start with a reasonable price to begin with? Then there wouldn't need to be heavy discounting, and everybody would be happy. Looks like a neat little set that we could have incorporate into Assault on Hoth but it's retired already. Wondering if I should get this as I can incorporate this into a Hospital. thought it looked more like a £20-£25 set. I wish they had made FX-7 the right colour though. 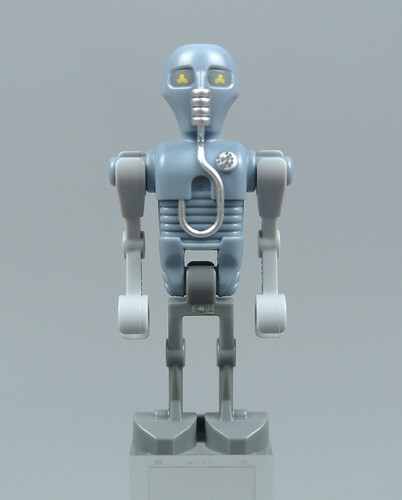 He is not a black droid but grey. ah well easy to fix!!!! 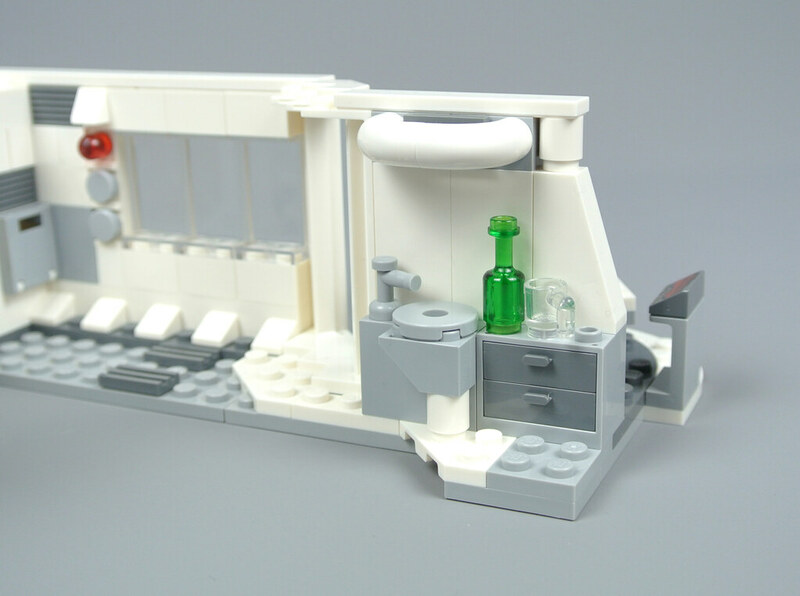 Lego should makes a set similar to this as an add on to the 60204 city hospital. The only thing that is missing is an updated R-3PO. Wish they would've included it! 50 euros in the Benelux; isn't that what some would call a scam? This seems to be a very nice set with desirable minifigures and I will definitely buy it at some point. That said, Lego is really (!) pushing it this year with their pricing: 40 Euro is already tough, but 50 Euro is just a bad joke. However, the thing that bugs me most is the perceived arbitrariness of the pricing: why are Han Solo's Landspeeder, or Cloud-Rider Swoop Bikes, or Yoda's Hut all 30$/Euro and why does this set all of a sudden cost 40 Euro, i.e., 33% more? Right now, I am not even willing to go to Kaufhof to get it at "only" 25% discount.